When deciding which nail salon to visit, pay attention to your surroundings. “It is important to ask yourself a few questions,” noted Dr. Chambers. Salons are legally required to refuse clients with nail fungus. If you notice the person next to you with a fungal infection, leave. The bacteria from nail infections spreads quickly and easily. 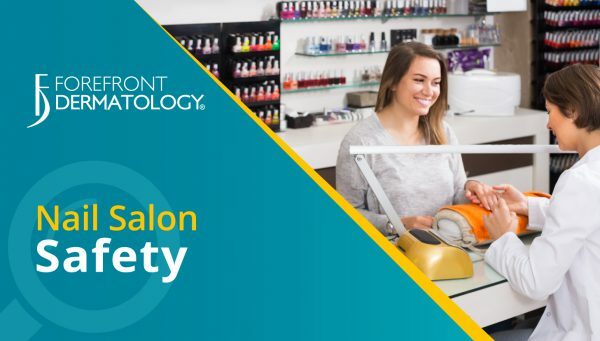 If the salon you are visiting opts to clean tools in disinfectant versus using disposable tools, avoid visiting during their peak time. All tools must soak in disinfecting solution for more than 20 minutes. If the salon is crowded it may cause technicians to soak tools for less than the recommended times. Request to have your cuticles pushed back, not trimmed. Cutting back cuticles can spread germs from person to person increasing the risk of infection.